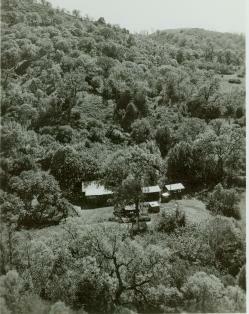 Camp Bertha, named after Bertha Rowell, was purchased by Harry and Bertha in the 1920's and was the "first" Rowell Ranch. Nestled in the Livermore Hills, Camp Bertha consisted consisting of over 12 sections of land that covered Alameda, San Joaquin and Santa Clara Counties. Rolling hills, large oak trees and an abundance of wild animals, including an herd of elk (which is still wandering in the Livermore Hills today), and many ponds made Camp Bertha "Heaven on Earth". Harry and Bertha used this land to graze their cattle on during the summer months. Harry believed that there was something special about the grass in the these hills as the cattle never had to be supplemented during the summer months and the cattle would easily gain weight grazing in these hills. Harry and Bertha would arrive at Camp Bertha early in May and stay until the end of September. They always had a crowd of people every weekend and during hunting and fishing season the crowd would number over 100 people. Harry kept the ponds stocked and maintained. He also made sure that the deer population was strong and even imported five white stags from England to breed with the native deer population. The entrance to Camp Bertha. 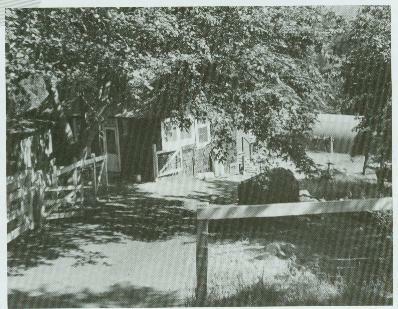 The Ranch House was built in the early 1920's and still exists today. 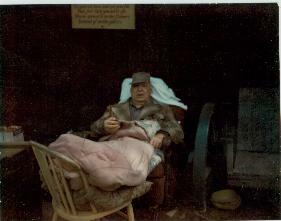 Harry loved to hunt and he would organize the outing like General Patton. He had strict rules including no alcohol, no smokings on the trails, no shooting of the does and fawns and no one takes a shot unless the hunter has a clear shot and most important absolute silence. Harry loved the land and the animals and maintained strict rules when hunting. Anyone who broke the rules was chewed out and never allowed to hunt at Camp Bertha again. Harry's great-grandson, Sonny, fondly remembers hunting with Harry. Sonny was "about knee-high to a grasshopper" when he first went hunting with Harry. Sonny knew the rules and knew better than to even attempt to break them. He sat in silence with Harry on "point" and waited for a very long time. So long that Sonny really need to heed the call of nature, but he kept silent anyway. His bladder won out and Harry looked over at him seeing that he had an accident. Harry gave him the "Rowell Scowl" and said, "My God, sonny, if ya have to do that, you can disturb me and we can take care of that". 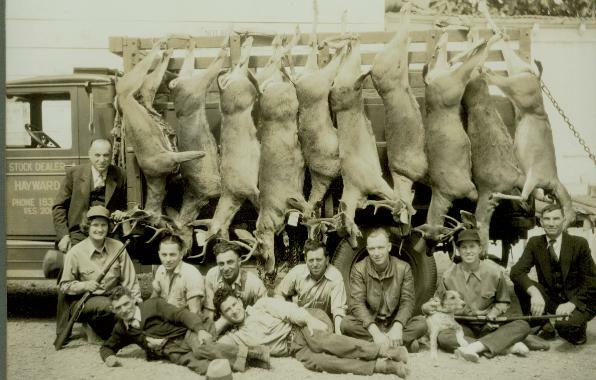 After the hunt, the deer would be brought back to the camp and a big party would take place with venison for dinner. Singing and dancing would follow with everyone having a great time. 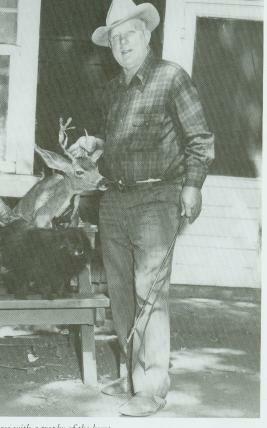 Harry was a great hunter and the walls of the main ranch house at the Dublin Canyon Ranch were decorated with deer and elk antlers along with coyote skins, and cougars. Camp Bertha was a treat for everyone including the kids. Sonny and Desiree spent every summer at Camp Bertha until Harry died and Maggie banned them from Camp Bertha. On the last day of school they would go straight up to Camp Bertha and come back the day before school started in September. During the day they would ride horseback and ride haywagons to feed the livestock. Camp Bertha was ridden with rattlesnakes and they would search them down. They would fish and look for coyotes, cougars and bears. At night the adults would have the unsuspecting children play a game called "snipe hunting". The kids were given brown paper bags and flashlights and the adults would take them up to the rocky point behind the ranch house. The adults would have them open open the brown bags and shine the flashlight into the bag. Then they would tell the kids to wait and "soon" a snipe would come out of nowhere and run into the bag. Then the children could have their own pet snipe. Of course this wasn't true, but the kids would spend hours standing with the bag and flashlight waiting for the snipe to come out. 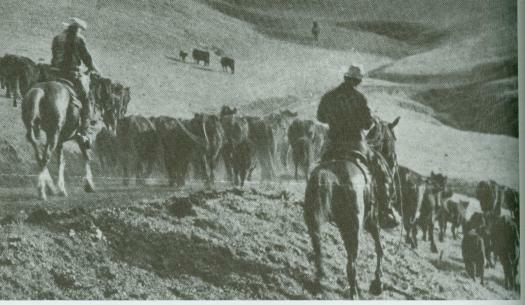 However, the biggest event at Camp Bertha was the yearly roundups to gather the cattle and move them down to the "low" ranch in Dublin Canyon. Several generations of ranchers in the area would come to help roundup the cattle and afterward there would be a big celebration with food and drink for everyone. Once when the cowboys were getting ready to move the cattle, Sonny, who was about 10 at the time, was in the corral trying his hand at roping steers. Sonny tossed a loop over a bulky steer just as Harry arrived in his Land Rover. The steer ran off, dragging Sonny with him around the corral. Sonny refused to let go and the steer dragged him through mud and manure. Everyone watching laughed so hard until Harry, who was not laughing, said, "What are you trying to do Sonny, run the fat off my cattle?". Harry had nothing more to say to his grandson for a while. Sonny learned later that it pleased his grandfather seeing that I had gone in there and caught a steer and didn't turn him loose. Harry said that I had tenacity. 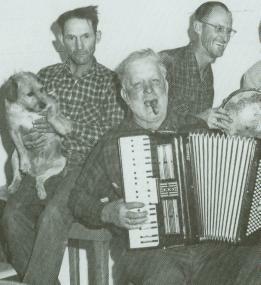 Harry Rowell died in August, 1969 at his beloved Camp Bertha. Harry and Bertha's descendants were banned from Camp Bertha the following year by Maggie Rowell. They were never allowed or invited to Camp Bertha again. The Executors of Maggie Rowell's will sold Camp Bertha to East Bay Regional Park District for $175 per acre. The Executors all received life estates at Camp Bertha. Harry and Bertha's descendants have very fond memories of Camp Bertha and the many summers they had a chance to spend there. Sonny, sums up best how Harry and Bertha's descendants feel about Camp Bertha: When I was growing up I thought Camp Bertha and The Rowell Ranch would last forever. I never thought it would be gone, that the ranch and my great-grandparents' and my grandmother Elizabeth's legacy would be forever. I know that I learned from being up there and a lot of who and what I am, stuck, because I was around people up there who I respected. Most of the Ohlone Wilderness is now what was Camp Bertha. However, the ranch house, the two cabins and a small barn still stand there today along with fond memories of a life style that is now as silent as the wind that blows through the mountains surrounding Camp Bertha. Back from a hunting trip at Camp Bertha - Elizabeth Rowell is second from right.